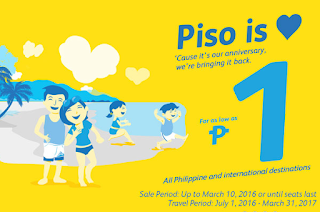 Cebu Pacific's Piso Fare promo is back! In celebration of its 20th anniversary, Cebu Pacific, the country's leading low-cost airline, is offering base fares for local and international flights for only P1. The sale starts on March 8, 2016, and will end on March 10, 2016 or until seats last. If the terminal fee, web admin fee and VAT are added to the base fare, a ticket for flights originating from the NAIA Terminal would cost P369.12 -- P484.12 if from Cebu and 384.12 if from Caticlan. For the rest of local terminals, one can get a one-way fare for as low as P184.12. Seats for international routes are also included in the promo. Travelers can avail an all-in one-way ticket fare for as low as P701 for short haul and P751 for long haul. 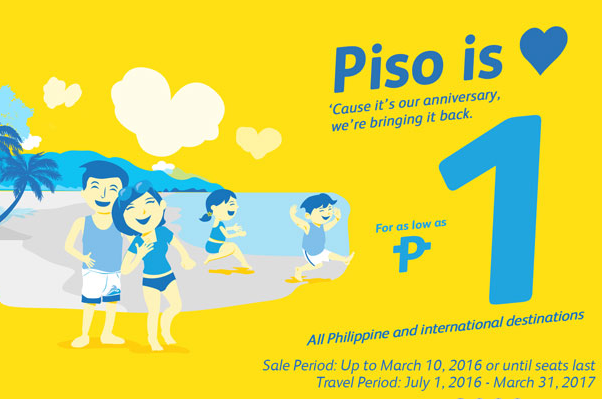 The promo is valid for flights on July 1, 2016 until March 31, 2017. Noypistuff Tip: Because it is getting so much traffic, the Cebu Pacific website may show errors. We suggest that you use the mobile app when booking. However, you have to have a credit card to be able to book using the app. Were you able to get Piso Fare tickets? Where are you headed? And how much did you pay? Feel free to comment below. if Piso fare tickets how much will be the total fare from Manila to Cebu for 4kids and 1 adult using credit card visa? To know how much you will be paying, please visit cebupacificair.com and do a mock booking. You can also download the Cebu Pacific app and try booking there. Please take note that the flights should be on July 1, 2016 to March 31, 2017.